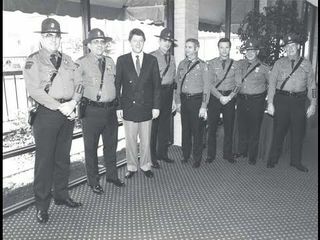 Troopergate was where Bill Clinton allegedly used Arkansas state police assigned to his security detail, to keep an eye out for Hillary or ferry women in and out of the Governors mansion for him (as well as keep track of his sexual scoring system). While Hillary was using state troopers to take her to clandestine meetings with Vince Foster at a resort (for an alleged affair). Most of the media ignored the story, as they didn't want to harm their change-agent du jour, but then this lead to Paula Jones and many others, and even they couldn't ignore that much salaciousness. Despite 4 different troopers corroborating the stories (multiple Women coming forward or being discovered, including Paula Jones and Jennifer Flowers), and writer David Brock documenting many details of times, dates, with corroborating witnesses, he later apologized to Bill Clinton for breaking the story. The troopers had gotten paid for telling their stories, and he considered that a violation of journalistic ethics. Of course, most of the accounts still appear to be true, but that doesn't matter to Clinton supporters. Snopes touched on in an broader article trying to make excuses for all of Hillary's scandals, and did the same on this, claiming, "the troopers weren't credible". And yeah, it was completely out of character for Bill to use his power to satisfy his sexual proclivities. This page was last edited on 14 April 2019, at 21:46.